Birders know why Alaska is known as The Last Frontier. Because when you’ve painstakingly built your life list over the years, visiting the corners of North America for specialties and pushing your ABA list to 600 or so, Alaska almost always remains as the last place a birder can visit where bucket-loads of lifers, the sort of haul you really only get in the early years, are still possible. I’ve been fortunate enough to see a lot of the Lower 48. I’ve tackled Texas, collected in California, fooled around in Florida. I’ve even paid a few calls to Massachusetts in the dead of winter for finches and owls. But until this past month, I’d never been to Alaska. That all looked to change when I was called upon to help out with an ABA event on St. Paul Island, that rarity magnet in the middle of the Bering Sea. I had some friends in the Anchorage area who were generous enough to offer to put me up, and I made plans to arrive a day early so I could take in at least 24 hours on on-land boreal birding. The Anchorage area hosts a number of far norther species I could never hope to see in North Carolina, and I quickly pulled together a list of targets and my friends made a plan. I’m not sure what I expected when I finally got a look at Anchorage, the largest city in Alaska. At 300,000 people, more or less, it’s really no bigger than the town I live in now though it’s reputation looms larger than the mid-sized every-ville of Greensboro, North Carolina. There are no large buildings, but it boasts a relatively cozy downtown and a big downtown airport, and certainly no city in the world can claim a view of the massive Denali looming on the horizon. But not far away are some incredible mountains, and true, unadulterated wild places. I was looking forward to seeing them. We spent the morning cruising around some local hotspots in the city. I quickly picked up Mew Gull and Glaucous-winged Gulls as lifers as they were everywhere. There were a not insignificant number of apparent Herring x Glaucous-winged hybrids too, with black tips and pale mantles. A flock of the ever-present Black-capped Chickadees netted me a hoped for Boreal Chickadee, smaller, browner, shyer and vacating its perch a fraction of a second before I could get a photo. Fortunately, mountains don’t move. 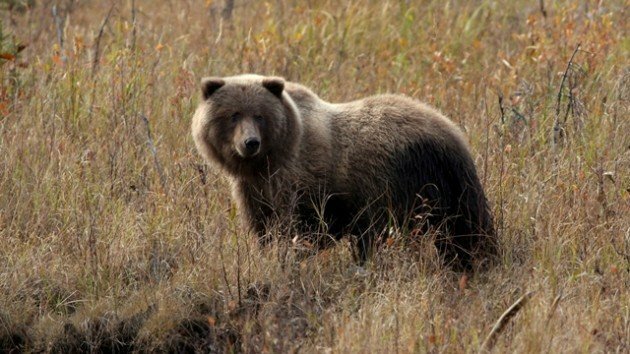 A mid-sized Grizzly Bear was slowly making its way along the opposite bank of the river. It seemed to pay no attention to us, nor the half-dozen other people who were watching it in awe from the observation deck at the nature center. When a pair of walkers with a dog came down the path, however, it paused to look them over. The dog barked, and the bear picked up the pace as it headed away from us, finally disappearing into the grasses around the bend. What an incredible experience. High off the bear, and only a little chagrined that the Gray Jays bugged out in the interim, we continued down the trail. Rounding the corner, I paused when I saw a gray lump in the middle of the trail. A male Spruce Grouse, one of the more incredible birds I’ve ever seen, was camped out in the middle of the trail picking at seeds or rocks or whatever. I was instantly enthralled. I understand that Spruce Grouse have a reputation for this sort of behavior, being unwary birds generally. But I was not prepared for this. The bird was no more then 30 feet away, close enough to fill the frame of my camera lens. A few people came up behind us, local Alaskans, and while they were pretty stoked to get so close to such a cool looking bird, I don’t feel like they completely grokked the situation. Maybe this is the sort of thing Alaskans deal with all the time, I don’t know. I can see why people come here and never leave, though. Check out those crazy feathered feet! Eventually we had to move on, so we walked up the trail shooing the grouse off to the side as we passed. It moved about 3 feet off the trail and watched us haughtily as we passed. Because that’s what animals do in Alaska. They’re just there, and the people in the Anchorage area just have to work their lives in around them. This is a place where moose wander through neighborhoods. Where the nearby military base has a pack of wolves on it. 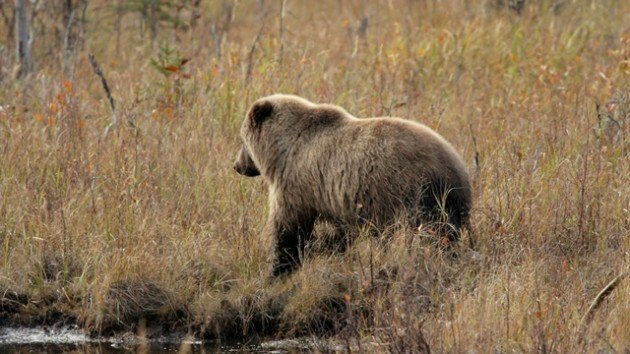 Where bears are loose and grouse wander around with impunity. It’s pretty great. I was off to St. Paul the next day. Looks like a kickass place. That said, I can’t help feeling the opening paragraph is missing an important qualifier. Maybe “Alaska is great for picking up lifers like when you started birding if you’ve taken a blow to the head and forgot the test of the world also has birds.” ???? Great post!!! Those bear pics are just incredible. 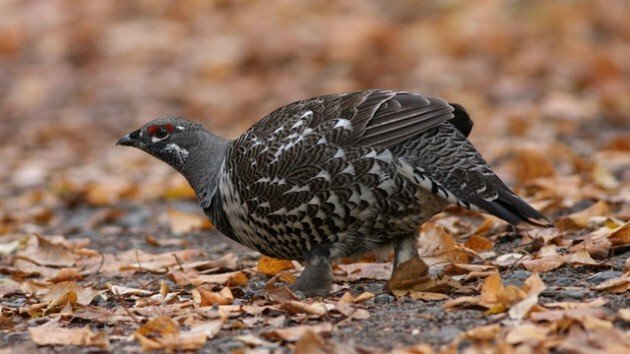 And I will never forget my life (and only) spruce grouse: it flew onto the trail and walked towards me specifically to check what strange creature I was. This is the only bird that ever twitched me, not the other way around. I picked up my life Spruce Grouse in Eagle River too. I was so excited about seeing bears that even the squirrels made me jump! @Duncan – I *guess* so, and I realize flying the same distance south would see me find several hundred new birds, but for the combination of critters and scenery, Alaska cannot be beat. @Jochen – Thanks! It was pretty close, I was relieved there was a river between us. 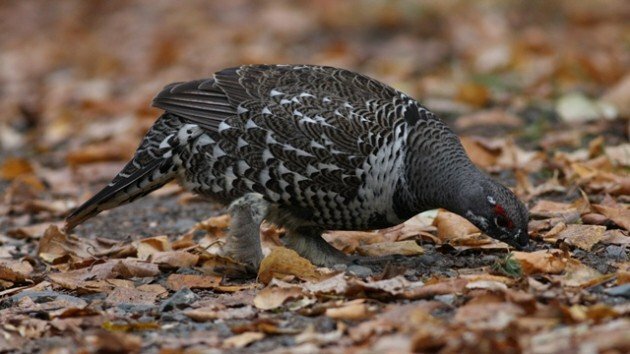 Spruce Grouse are odd birds to be certain. @Redgannet – Very cool! It’s remarkable that there is so much wildlife so near to a decent sized town of Anchorage. Don’t get me wrong, I want to go there myself (Denali is third in my NA bucket list after Cocos Island and Yellowstone). But I can never resist an opportunity to poke a case of ABAitis with a stick when I see one. Oh, no question. But I don’t see east Asia in my future, so I’ll take what i can get!